So on Monday we went to the Tenement Museum on the Lower East Side. Spurred on by visiting friends, (isn’t that always the way), we decided to tag along with their plans, and all met up in time for the 1:45 tour. 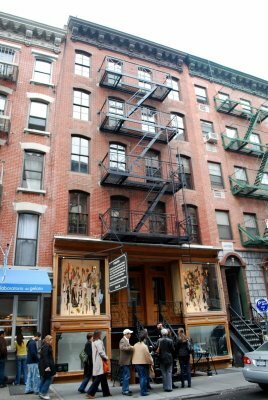 The Museum, founded around 1988 by Ruth Abrams and Anita Jacobson, owns the now partially restored tenement at 97 Orchard Street. Built in 1863, the tenement (actually just a common word for apartment, despite negative connotations) had over 7000 occupants in the fifty years that it was open for business. After sitting idle for almost as long, the building was discovered, and the museum’s journey begun. Helping visitors understand life in working class New York at the end of the nineteenth century is the goal of the museum. By taking museum patrons on a journey through the life of one of four different families, the tours open a specific window into lives that were difficult by modern standards, and yet surprisingly parallel to experiences some immigrants still have today. We chose the newest tour, the Moores, a family of Irish immigrants that were part of the wave of Irish people coming to the US in the 1860’s. The Moores lived briefly at 97 Orchard Street starting in 1869. A primarily German area at the time, the Moores would have been out of place in the building, isolated because of language. But the building itself had certain amenities that would have meant a “step-up” from other more Irish neighborhoods. Certainly nothing to speak of now, the building’s underground sewage system meant that waste was carried away from outhouses located in the back “yard” of the building, and that running water in the form of a tap out back (next to the outhouses) was available. Inside the apartments, however, there was no water and no indoor plumbing. Because there were no city health ordnances yet, there was no protection for renters. Diseae ran rampant. So much so that infant mortality was exceedingly high–as Bridget and John Moore found out when their five and a half month old passed away. Wages at the time (if you could find a job—racism was at an all-time high—especially where immigrants were involved), were something like $20 a month. To put it in perspective, rent at 97 Orchard at that time was $10. So the Moores were paying half their income for a three room walk up on the fourth floor with five of them, including the baby, in residence at the time. The apartment itself, had a large (for New York) living area, a smallish kitchen/workroom and a tiny bedroom. Only one room had windows, and while it might have afforded a breeze, the rest of the apartment would have been stifling in the summer and probably except for the kitchen with its iron stove, freezing in the winter. Living just below subsistence level, families were malnourished, which lead often times to disease and early death. In addition immigrants also delt with isolation, due to in part to prejudice and in larger part to the fact that often one’s entire family had been left in the “old country”. And yet, many of these people not only survived but triumphed, their children moving up and onward, finding their place as Americans in New York. 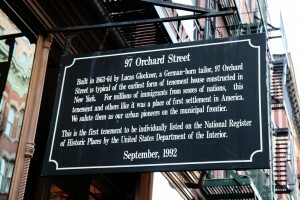 The Museum, open every day except holidays, can be contacted through their website at http://www.tenement.org/tours.php or by phone, 866-606-7232. Tour reservations are recommended. Other tours include different decades and immigrants, so I suspect repeat visits would be equally interesting. All in all I highly recommend taking the time to get to know a little bit more about New York’s immigrant communities. There are also two walking tours of the area available. Photographs are not allowed, so all pictures used here are from Flickr and the Tenement Museum website. Almost impossible to imagine, but the fact that there are families probably living in comparable conditions today would make one of these tours particularly striking. Thanks for sharing the details, Dee, and yes, for us native New Yorkers, we really need to get out more. Shame on me for not taking advantage of all the wondrous historical stuff here in NYC! and there is some really cool stuff to see! Very cool! I would have taken one of those tours if I’d had any idea they were there. Now I do. Hi my mother was Josephine Baldizzi. She was actually the person living at the time when Ruth came upon the Tenement. She was able to recreate the apartment with most of its original artifacts because my Grandmother never through anything away and neither did she!. Hearing her voice as you go through the apartment breaths live into it. My children and I go every mothers day just to hear her voice. If you have a change go back and visit the Baldizzi/Grumperts apartments they are wonderful. Wow. What a wonderful testament to your mom! I will definitely have to go back! When you go back the tour guide will tell you that my mom was walking down Orchard Street and just walked into the tenement and said “I used to live here”. This isn’t correct. The correct story is that she read in the news paper that Ruth Abrams was opening up one of the boarded up tenements and was looking for anyone that might still be alive that lived there. After a week of should I shouldn’t I, she called the news paper. Then they did a 1/2 special with Vic Morrow on NBC filming my mother walking into her old apartment for the first time in over 50 years. Since Ruth has gone things have changed slightly. They used to change the apartment at Christmas time. My Grandfather was an out of work carpenter at the time, so he used to follow people who were dragging their Christmas trees home that they had just purchased. He’d collect the branches that fell off while they dragged their trees. Then while my mom and Uncle Johnny were a sleep he would take the handle from my Grandmother’s broom and drill holes in it and place the lose branches in the holes. When they woke up the thought they had a real tree! Every year Steve Long the curator at that time would recreate the tree with my mother’s approval and tell the story. They don’t do this story any more.